Earlier this month the PhoneGap team held the first PhoneGap day. This was in part to celebrate the release of PhoneGap 2.0, but more importantly to bring together members of the PhoneGap community to share and learn from each other. There are great recaps of PhoneGap Day from RedMonk, as well as on the PhoneGap blog. One of the new services announced on PhoneGap Day was emulate.phonegap.com. Emulate.phonegap.com enables an in-browser simulator for developing and debugging PhoneGap/Cordova applications, complete with Cordova API emulation. It is built off of the Ripple Emulator, which itself is open source and may even be contributed to the Apache Cordova project. Emulate.phonegap.com is built as a Google Chrome Extension, so it requires the Chrome browser. It also uses the Ripple Operating Environment (another Chrome Extension). Once you have the dependencies installed you can emulate any site as a PhoneGap/Cordova application by either going to emulate.phonegap.com and entering the target URL, by launching the emulator from a right-click -> Emulator -> Enable, or by clicking on the Ripple icon in the Chrome toobar, and selecting the “Enable” option. Once launched, the URL that you want to simulate will be displayed within the Ripple operating environment view. Note: This only works with assets that are on a live URL. You can use a local http server with references to localhost, however the emulator will fail if you try to access your application directly from the local file system using a file:// URI. 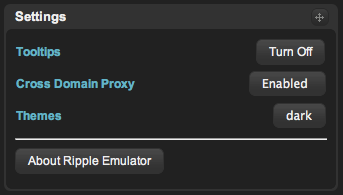 Update: You can enable access to local files by changing a few settings on the Ripple emulator. See the first comment on this post for additional detail. The emulator environment gives you the ability to emulate PhoneGap events and API calls, without having to deploy to a device or run inside of the iOS, Android, Blackberry, or other emulator. Not only can you simulate the PhoneGap/Cordova API, but you can also use Chrome’s debugging tools to test & debug your code – complete with breakpoints, memory inspection, and resource monitoring. This is a handy development configuration. It enables app development within a rich debugging environment that is familiar, fast & easy to use. This does not replace on-device debugging however… nothing will replace that. On-device debugging is extremely important; this helps increase your productivity as a developer. So how do you use this environment? The environment will handle Cordova API requests, and you can also simulate device events. First, the “Devices” panel… In this panel you can select a device configuration – Everything from iOS, to Android, to BlackBerry. Changing the device configuration will not only change the physical dimensions, but will also change Device/OS/user agent settings reported by the application. 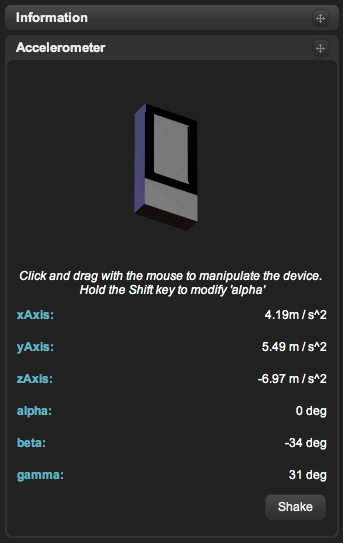 Here you can also select the device orientation, which will change the visual area within the simulator. Within the “Platforms” panel you can choose the platform you wish to emulate. With respect to PhoneGap applications, you will want to choose “Apache Cordova”, and then select the API version that you are using. 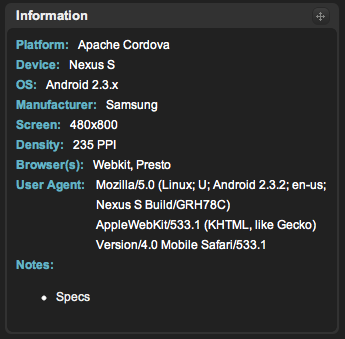 By default, it uses “PhoneGap 1.0.0”, however you can chose “Apache Cordova 2.0.0” to get the most recent version. 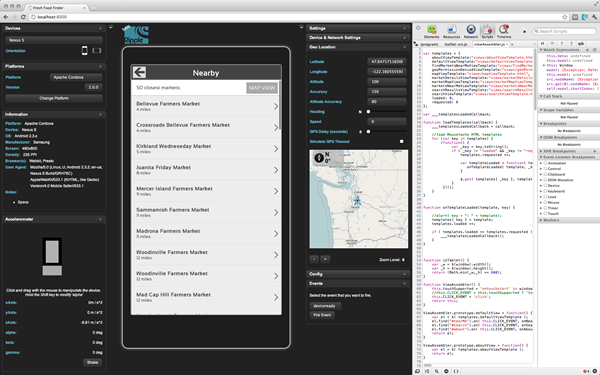 The Ripple emulator also simulates BlackBerry WebWorks and mobile web configurations as well. The “Accelerometer” panel can be used to simulate device orientation/accelerometer events. Just click and drag on the device icon (the gray and black boxes), and the icon will rotate in 3D. As you drag, accelerometer events will be dispatched and handled within your application. From here, you can even trigger a “shake” event. 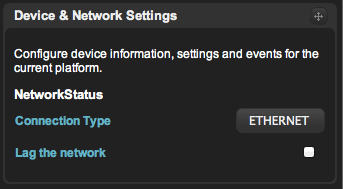 The “Settings” panel lets you turn on/off the cross domain policy, adjust the UI color theme, and view additional data about the Ripple emulator. The “Geolocation” panel enables you to simulate your geographic position within your PhoneGap/Cordova application. You can specify a latitude, longitude, altitude, speed, etc… You can even drag the map and use it to specify your geographic position. The position that you set within the geolocation panel will be reported when using navigator.geolocation.getCurrentLocation(). The “Config” panel is a graphical representation of your PhoneGap Build Config.xml file. You can use this to easily view/analyze what’s in your application configuration. The “Events” panel can be used to simulate PhoneGap specific events, including “deviceready”, “backbutton”, “menubutton”, “online”, and “offline” (among others). Just select the event type, and click on the “Fire Event” button. PhoneGap 2.0 has just been released! This is a great step forward for PhoneGap, with a much improved developer experience. Read all about PhoneGap 2.0 on the PhoneGap blog, and check out the changelog for detailed changes in this release. Or, just go download it and get started today! Currently, the “normal” use case for Edge is creating interactive experiences that are loaded when the page loads. You can chain animation compositions in sequence, but they have to be in the same wrapper HTML file. This works great for a number of use cases, but one thing I wanted to do is create an Edge animation and use that as a component that is arbitrarily added to the HTML DOM at any point in time. My findings: It can be done, although with a few gotchas. Using Edge animations as components inside of a larger HTML experience isn’t the primary use case which Edge was designed for. However this use case is being evaluated and may end up in Edge at a later date. If that happens, this process will become much easier. Wouldn’t it be cool to have a really elaborate loading animation while loading data from the server? We could use Edge to build the animation! All images used in these animations were obtained from thenounproject.com. Once the animations were complete, I started looking at the generated HTML output, and figuring out how I can add it to the HTML DOM of an existing HTML page. I then started putting together the sample application using Mustache.js as a templating engine to abstract HTML views away from application logic. Note: I also have a simple utility that enables me to include Mustache.js templates in separate HTML files, so that I can keep everything separate. Inside of the “contentHost” div, all UI is added to the HTML DOM upon request. Basically, when the user clicks a button, the Edge animation is added to the DOM, and then the animation begins. You can’t have multiple instances of the same Edge animation in a single HTML DOM – at least, not easily. 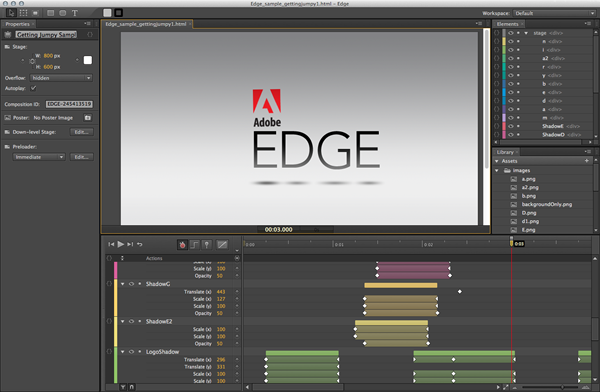 Each Edge animation is assigned a unique ID. This ID is referenced in the HTML structure and the *_edge.js, *_edgeActions.js, and *_edgePreload.js files. You would need to assign a unique ID to each instance, and make sure everything is referenced consistently. It will be very tricky asynchronously add more than one Edge animation at the same time. The shortcut that I used to get these to render was to wipe away the Edge variables in JS and reload them – this would cause some issues with more than one animation. If the capability to have Edge animations as components gets built into Edge (which I hope it does! ), then you will not have to go through all of these steps, and it will be much easier. I’ll be sure to share more if this feature develops. I’ll be speaking at a few conferences in the next few months on PhoneGap and web standards-based development. Here are just a few, with some more pending. Be sure to come check one out (or all of them)! Where architects and developers of all levels come to gather, share and learn about creating the next generation of web based applications. RIAcon’s goal is to help you network with fellow industry professionals and expose you to the best content. Interested in developing applications for mobile devices, on multiple platforms? Interested in leveraging your existing web development skills to build natively installed applications? Just looking to expand your skill set? Come join Adobe Technical Evangelist, Andrew Trice, to learn about cross platform mobile development and PhoneGap. In this session, you will get an introduction to PhoneGap (Apache Cordova), be able to see example PhoneGap applications, and walk through the process of building your first PhoneGap application. Every year Dreamforce features stories and presentations from some of the brightest minds in technology, business and beyond. This year’s Dreamforce promises to be even more informative and dynamic, with our most exciting keynote speaker lineup yet. The cloud computing event of the year is also the Social Enterprise event of the year. This is where you’ll learn everything you need to know—from the industry leaders who are paving the way—about how the Social Enterprise revolution is changing the way we do business. Native applications built using web technologies can suffer from the “uncanny valley” effect – where they don’t feel quite right as a native application. In this session we’ll focus on strategies to make your apps feel like native apps, including considerations for a native-feeling UI, platform consistency, and user experience.